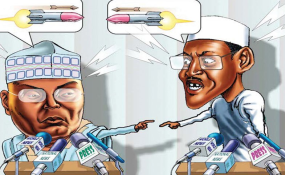 Nigeria: Fears of Foreign Interference and Intervention in Nigeria's 2019 Presidential Elections - Quo Vadis? One critical issue retained national attention in the past one week in Nigeria: the question of interference and intervention, which was raised during the two-hour Tuesday Live programme on the National Television Authority (NTA). The programme was anchored by Cyril Stober, a seasoned and respected journalist, on Tuesday 5th February from 10.30pm. The panelists included the Governor of Kaduna State, Mallam Nasir Ahmed el-Rufai, Mainasara Kogo Umar, a lawyer, Dodeye Arikpo formerly of the DSS and a Security consultant and Mohammed Bello Shehu, a former Student activist. One challenge that arose from the discussion was how to have a free, fair and credible election on February 16, 2019. Within the context of this objective, the fears and implications of foreign interference and intervention in the elections were also raised. They generated different arguments on whether interference has the same meaning as intervention and whether 'interferences' and 'interventions' by foreign countries in the domestic affairs over which Nigeria has exclusive competence are internationally lawful. The position I took on the matter, which was the need to differentiate between an interference, a common feature of diplomatic practice, and an intervention, which is outlawed but still permissible within the context of collective security and Chapter VII of the UN Charter, apparently did not augur well with Mallam el-Rufai. In reaction to this he stated that anyone seeking to intervene in Nigeria's domestic affairs must expect to return home in 'body bags,' that is, dead. The statement generated interesting mixed reactions. That of the European Union Election Observer Mission to Nigeria is particularly noteworthy. The PDP (People's Democratic Party) considered el-Rufai's statement as 'incendiary' and has, therefore, not only threatened to withdraw its commitment to the peace accord reached with the National Peace Committee on peaceful elections, but also called 'on the international community to immediately impose a travel ban on el-Rufai for allegedly inciting violence in the country ahead of the general elections.' Thus, a diplomatic row is already in the making. It can be contained if el-Rufai's statement is considered and tenable in the context of the principle of non-intervention and not in the context of non-interference. As we noted in this column on February 25, 2018 (vide Vie Internationale on "Interference in Russo-American Relations and the Indictment of Internet Research Agency LLC), the meanings of interference and intervention are, more often than not, confused. We noted then that many observers and analysts often wrongly use interference to imply 'intervention,' and therefore to mean the same. Even in their ordinary meanings, it is still useful to differentiate between the two. In international law and relations, their meanings are quite distinct. However, the discussants at the Tuesday Live programme referred to above largely, but wrongly, predicated their submissions on the assumption that interference is synonymous with intervention. This confusion is most unfortunate because of its implications within the context of Nigeria's 2019 general elections and global developments. Many Nigerians, rightly or wrongly, not only hold the belief that the elections will be rigged, but also that they might engender destructive violence. This fear also created great concerns for the international community. The opposition parties, led by the People's Democratic Party (PDP), called on the international community to interfere and even sanction some APC (All Peoples Congress) politicians. It is this call on the international community and the controversy generated that is actually threatening the 2019 election, as well as national security. For the umpteenth time, we insist here that when the word 'interference' is used in international relations, it simply implies that the act of interfering involves the use of diplomacy in crisis management, and particularly the use of pacific means of conflict settlement and means of complaint. In this regard, interference means a problem or a misunderstanding is still at the level of a crisis from a polemological perspective. It is when diplomacy fails in resolving a crisis and the crisis degenerates into the level of a conflict (involving the use of force) that we can talk about an intervention. An intervention necessarily implies the use of force. It is the use of force, which defines intervention, and that is why it is prohibited in international law and relations. Interference is a daily, even a minute-by-minute, occurrence. As we noted in February 2018, 'there is always an act of interference in every interpersonal or inter-state relationship. When people discuss an issue, they consciously or otherwise refer to a third person. They condemn or commend foreign statesmen when they make their comments. Such condemnation or commendation necessarily constitutes an act of permissible interference. There is therefore little or no problem with an act of interference but there is with that of an intervention. It is useful to also note at this juncture that the principle of non-intervention in international relations is only valid at the level of unilateral intervention. No individual or group of countries is allowed to intervene in the affairs that fall within the domestic jurisdiction of any sovereign state. However, when an issue or a crisis falls within the purview of collective security, intervention is allowed. Thus, there are permissible and non-permissible interventions in international relations. This is made clear in Article 2, paragraph 7 of the United Nations Charter: 'nothing contained in the present Charter shall authorize the United Nations to intervene in matters which are essentially within the domestic jurisdiction of any state or shall require the Members to submit such matters to settlement under the present Charter; but this principle shall not prejudice the application of enforcement measures under Chapter VII.' It should be noted that, in this provision, it is the word 'intervene' and not 'interference' that is used. This means that interference is not outlawed. There is no country in the world that is not interfering legally or illegally. We already referred to the case of intelligence gathering which is part of diplomatic practice. All defence attachés engage in intelligence gathering. The important point of note is that their operational areas are not always in their host countries. Another point is that no country condones spying but it is allowed. It is allowed only to the extent that the spy is not caught. Spying is what is often referred to when it is said that diplomats engage in activities that are not generally compatible with the status of a diplomat. In other words, all countries condone interferences to the extent that their core national interests are not threatened. If this is not so, there will not be any good basis to justify the existence of their intelligence agencies. For instance, Nigeria has the DIA (Defence Intelligence Agency which covers the military domain of intelligence gathering, the NIA (National Intelligence Agency) which is saddled with intelligence gathering at the level of foreign relations, and the DSS (Department of State Services) with emphasis on national security. For the purposes of national security and political stability, especially during and after the 2019 polls, government has drawn attention to intelligence reports indicating the likelihood of foreign interferences in the elections. It is even argued that the calls on the international community are aimed at disrupting, as well as possibly preventing the holding of the elections in order to allow for the declaration of a state of emergency, and therefore, the continuity of the Buharian administration. interference is an act. Intervention is also an act but the difference is made clear in how the act is manifested. For instance, the same dictionary has it that the meaning of an interference varies from one discipline to another. In sports, it means the obstruction of the actions of an opponent in an illegal manner. In patent law, it is the conflict created by an application for a patent, that is claiming priority over an invention. In physics, it is the action of two or more wave trains or to counteract one another. In its general ordinary or non technical sense, an interference is simply about meddlesomeness, that is 'to enter into or take part unasked in the concerns of others.' Interference as an act of interfering should be explained and understood at this level of non-authorised meddling. It is also at this level that the Nasir el-Rufai-newly generated controversy and emerging diplomatic row between Nigeria and the invited international election observers should be located. Without jot of doubt, as noted above, it was my contribution at the Tuesday Live programme that prompted the initial controversy. I said interference should not be confused with intervention and that interferences are not only allowed but also that all countries of the world, as well as all peoples, individually or corporately, engage in acts of interference in international relations. As Mallam Nasir el-Rufai disagreed with the distinction in meaning of both concepts, there is the need for policy makers to thread more carefully to avoid further inducing President Buhari into error and diplomatic row over which the country has little capacity to manage in the event of deterioration and conflict. By giving impression to the general public that an interference is necessarily synonymous with an intervention, the international election observers are implied as part of those who are coming to intervene and who must be sent home dead, for coming to use force in the electoral processes, and with the ultimate objective of preventing the natural election outcome. To make the matter worse, Festus Keyamo declared in an NTA News Extra on Wednesday, 6th February that he had not only read international law to its highest level, and in this capacity, has submitted that no country is allowed to interfere in the domestic affairs of other sovereign states. He talked about non-interference in his interview but referred to the UN Charter which only talks about non-intervention, not in Article 2 (4) as referred to by Barrister Keyamo, but in Article 2(7). If Nigerian policy makers had been more careful in knowing the fundamental distinction between interference and intervention, between non-interference and non-intervention, and perhaps most importantly, between permissible and non-permissible interventions, a topic on which Professor Rafiu Ayo Akindele, former Acting Director General of the Nigerian Institute of International Affairs has written many essays, the statement by Mallam Nasir el-Rufai would have been perfectly in order. If anyone wants to intervene in Nigeria's domestic affairs contrarily to international law, the persons could even be carried home in body bags. They should simply be allowed to rotten and thrown to shirks to devour. However, this is not the case. The concept of interference does not even apply at the level of the international election observers for many obvious reasons. The election observers are in Nigeria on the basis of the kind invitation of the Government of Nigeria. Interference, as shown above, is meddling without being invited in the domestic affairs of Nigeria. Secondly, Nigeria cannot complain about foreign interferences in her domestic affairs when she is on record to have been interfering in the domestic affairs of others. Let us recall the case of President Olusegun Obasanjo and Sao Tomé and Principe. There was a military coup d'état in that country and Chief Obasanjo went there to insist on return of power to the civilian authority or accept to face the Nigerian military music. Thirdly, in terms of foreign policy, Nigeria is on record to have formulated exceptions to the principles of non-interference and non-intervention. In 1963, when President Sylvanus Olympio was assassinated, Nigeria's Foreign Minister, then Dr. Jaja Wachuku, considered that Togo was a major ally of Nigeria and that Nigeria would not allow the killing of a friend like Sylvanus Olympio to be swept under the carpet. There was need to interfere and possibly intervene. Another exception was the issue of the obnoxious policy of apartheid and segregation in Southern Africa. The same Dr. Jaja Wachukwu maintained that the policies of segregation and apartheid could not be rightly considered as falling within the domestic jurisdiction of any Member State of the international community. Nigeria argued in favour of interference and intervention, as well as led international campaigns against apartheid South Africa. In fact, Nigeria virtually chaired the United Nations Committee Against Apartheid before the dismantlement of apartheid in 1994. Fourthly, Nigeria has been engaged in several permissible interventions. Nigeria's intervention in Liberia within the framework of the ECOMOG is an example. In fact, Nigeria led the ECOWAS delegation to The Gambia to resolve the sit-tight crisis of the President, following the controversy surrounding the presidential elections in the country. Côte d'Ivoire is another good example because Nigeria actually prevented South Africa from both interfering and intervening in the conflict between Alassane Quattara and Laurent Gbagbo. Nigeria's opposition was on the basis of the African Union's Principle of Subsidiarity. This principle, which encourages regional organisations to first of all resolve their crises and conflicts in their immediate region before contemplation of referring them to the African Union is an expression of permissible intervention. Fifthly, it cannot but be a contradiction in terms if the current President of Nigeria, Muhammadu Buhari, could go to the Embassy of the United States for support and understanding as a presidential contestant in 2015 and then in 2019 be complaining about interferences. The visit to the embassy, considered as an exterritorial place in diplomatic parlance, is another expression of a call by President Buhari for US interference in the domestic affairs of Nigeria. Sixthly, there is the exemption to the prohibition of intervention in Article 2(7), which is the authorisation in Chapter VII of the UN Charter. This chapter applies to enforcements as approved by the United Nations, especially the UN Security. Seventhly, there is also the Principle of IR2P (International Responsibility to Protect) in international relations which allows for intervention when a Government is unable to protect its citizens, when there is a case of genocide and in the event of crimes against humanity. Eighthly, the rule of protection of the National Interest, especially in terms of national security and self-preservation, requires interference and even intervention. It is the logic of 'prevention is better than cure.' For instance, Nigeria's border is, in terms of geo-political propinquity, located at the frontiers with the immediate neighbours. In terms of defence lines, Nigeria's borders are considered to be located in as far away Mali and Mauritania in West Africa. This defence doctrine requires containing threats in far away countries before they are brought closer to the immediate borders of Nigeria. This is true for the region of Central Africa. Nigeria, in the context of defence lines, has to either interfere or intervene. Consequently, the understanding and application of the principles of interference and intervention must always be understood in context. This cannot but be so because no country in the world is an island unto itself. We are not only in a world of interdependence but one that is technologically globalising and in which the control of interference has been made more difficult. And true, Nigeria's capacity for both crisis and conflict management is, at best, low and not specialised and, therefore, unfortunate. The statement by Nasir Ahmed el-Rufai was carelessly made because he ought to have made his statement within the context of intervention and not interference. Other interferential statements, urging international observers not to interfere but only to observe the elections only point to poverty of ideas and suggestions, if not intellectual myopia, because interference is intrinsic in any act of observation. Observation is the first step in any act of interference. Probably one should ask what the interventionists and non-interventionists would say now that the former US President, Bill Clinton, alias 'Omowale,' thanks to Olusegun Obasanjo, is coming to Nigeria to actually 'interfere' in Nigeria's domestic affairs. The critical point of observation here is that interference and intervention are common practices even if they are not invited. The Venezuelan case is an illustration of this observation. Nicolas Maduro of Venezuela was given an ultimatum to quickly organise new elections or face international aggression. This is realpolitik or power politics which Nigerian politicians and policy makers must learn from. Nigeria, again, is not an island unto itself. The best way forward for Nigeria is to apply the philosophical foundation of Nigeria's foreign policy of Non-alignment in the determination of when to accept or not to accept an interference and intervention. More important, one French proverbial saying has it that, 'il faut s'informer avant d'informer,' meaning that one must first be informed before seeking to inform others. Always asserting before confirmation of facts is what is generally the bane of policy making in Nigeria. The president is directly responsible for the situation in which he has consciously put himself in this regard. Foreigners or election observers need not be threatened under whateve guise as any undue action on any foreigner or observer cannot but warrant reciprocal action in terms of either retorsion or reprisal. This derives from the rule of sovereign equality in international relations.